Though Christmas comes only once a year, the Star Trek Shuttlecraft Galileo ornament is an awesome, circa-1992 gift that just keeps on giving. Trust us. Sure, Christmas is over, but that doens't mean that cool Xmas stuff isn't still out there on the Web for your enjoyment and purchase. We took a quick look for some of the greatest retro Christmas accessories available in the vast wasteland of the Web and came across this gem: the Star Trek Shuttlecraft Galileo from Hallmark. We hear you, we hear you: "but Toymaster, isn't it just a nice plastic replica of a 1960's television show shuttlecraft?" Well, yes. But that's not ALL it is. Not by a long shot. Not only does the tiny shuttlecraft Galileo look just like its TV counterpart and light up when plugged into any standard Christmas tree light set, but it also features the voice of the one and only Leonard Nimoy. That's right - Mr. Spock comes to your Christmas tree. Thanks to a small button on the underside of the 'craft, anytime you'd like to hear some Spock talk, you can. With a just a quick press, you'll hear the logical precision of the world's favorite Vulcan sing out across your living room: "Shuttlecraft to Enterprise, shuttlecraft to Enterprise. Spock here. Happy Holidays. Live long, and prosper." Now if that's not a merry Christmas greeting, we don't know what is. 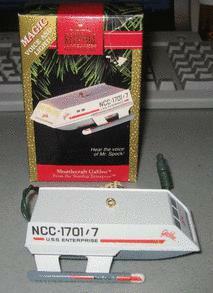 Released in 1992 the ornament quickly became a hit among Star Trek fans and can still be found on a number of Web sites including the venerable Amazon.com. The ornament is a durable, solid plastic and will last through many joyous (or stressful) holiday seasons, and thanks to the fact that the button restarts the recording every time it is pushed, you can take your holiday fun to the next level by having a rapping Spock in your house this season. "Sh-sh-sh-shuttlecraft. Shuttlecraft. Sh-sh-sh-sh-shtuttlecraft to Enterprise." Trust us, it's worth the $20. Live long, and enjoy.